A Nazi-era freight car now sits on a public plaza in Battery Park City, a relic of inhumanity and horror for all to see. Lifted by crane Sunday morning and gingerly maneuvered onto specially laid train tracks, the German-made car is like those used to transport Jews and other “undesirables” to death camps during the Holocaust. It is the gut-wrenching introduction to “Auschwitz. Not Long Ago, Not Far Away,” a major Museum of Jewish Heritage exhibition of artifacts from the Auschwitz concentration camp that will open on May 8 and continue until Jan. 3, 2020. 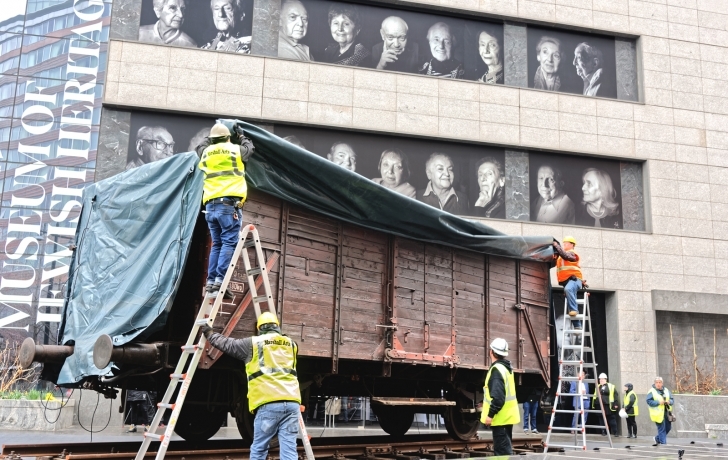 The restored boxcar is one of only five that are known to have been saved from tens of thousands used by the Nazis during the war. Cars like this one carried most of the 1.1 million people, including 1 million Jews as well as Poles, Roma, Soviet POWs and others, to their deaths at Auschwitz. Produced with the Spanish exhibition firm Musealia and Poland’s Auschwitz-Birkenau State Museum, “Auschwitz. Not Long Ago, Not Far Away” will exhibit some 700 items, including unpublished memoirs, personal artifacts of survivors and victims, a part of the Auschwitz fence, and the desk and other belongings of the concentration camp’s commandant, Rudolf Höss. Holocaust survivors Ray Kaner and her husband Leon Kaner, both 92, were at the museum on Sunday as living testament to the unspeakable brutality symbolized by the freight car. Ray had spent more than five years in Poland’s Lodz Ghetto before the Germans, with Russian forces in late 1944 closing in, shut down the ghetto and packed residents and their belongings into the trains, more than 80 to a car. The Germans lied to them about what lay ahead. “It was August, the heat,” she continued. “And all these people had room only to stand or sit. Only pales for urination. The smell. The sweat. We couldn’t even lie down on the floor to sleep. We had to be in a sitting position.” Kaner could not say how many days she travelled. “I don’t know whether it was two day or three days. I couldn’t tell day from night.” By war’s end she had lost all her family but one sister. The museum talked to survivors, held a community meeting and consulted with Terri Ruyter, the principal of P.S. and I.S. 276, the school across Battery Place.